I started my day reading a post by Rawn Shah called Work Out Loud because Everyone is Figuring Out Their Job. The post of course struck a chord and reminded me that this is #wol week. It is serendipity that I also happen to be reading Austin Kleon's Show Your Work! at this time. 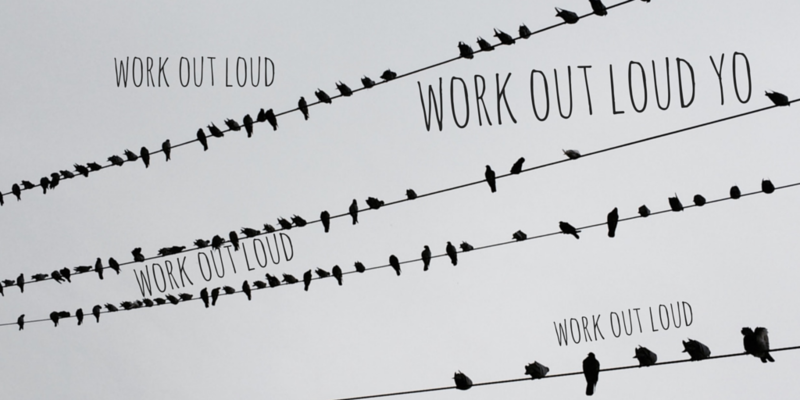 All of this made me think I should write a post on working out loud and its place in workplace learning. As is my wont, I tend to look at everything mostly through my L&D lens, especially when it comes to learning and sharing at the workplace. I have been thinking for a long time about what we, as L&D, need to and can do to foster a culture of sharing and collaborative learning to meet the challenges of a distributed workplace with dispersed expertise and complex work situations. In my mind, working out loud can be one of the means to strengthen organizational learning. "Working out loud is working in an open, generous, connected way so you can build a purposeful network, become more effective, and access more opportunities." "Once a day, after you've done your day's work, go back to your documentation and find one little piece of your process that you can share." I find this simple advice very powerful. As an L&D person, if we can inspire and motivate everyone to share one little piece everyday--be it a method for project execution or an insight gathered from the day, over a period of time this can build up to be an immensely rich repository of knowledge and tacit experiences. More than that, the individuals thus sharing acquire the skills of sense-making through narration of their work. Sharing invites sharing. When we create a space and expose our vulnerabilities and challenges, we invite others to do the same. Such sharing can trigger serendipity and meaningful conversation -- two of the critical factors that can shape organizational learning. Sharing brings each one's unique strengths and perspectives to the surface. It is a great way to encourage the coming together of diverse minds thereby creating a space and opportunity for innovation. Only when perspectives and processes are out in the open can the combinatorial aspect of innovation and creative thinking come into play. Organizations that invest time in coaching people how to work out loud and do it consistently can reap huge benefits. Serendipity is another by-product of working out loud. We serendipitously encounter others who are similarly passionate, have overcome similar failures and taken similar learning journeys. Working out loud shapes serendipity. Finally, as Austin Kleon says in his book, sharing can "take people behind the scenes." "A lot of people are so used to just seeing the outcome of work. They never see the side of the work you go through to produce the outcome." ~ Michael Jackson. Coming back to the role of L&D, and the need for collaboration and continuous learning, and engaging workers on the ESN--working out loud could be a good beginning. It takes practice and initial support. But I believe this could be achieved through modelling the desired behaviour. If senior leaders, members of the L&D team and other influencers (experts, senior and respected workers) engage in sharing their work by practising #wol, it would foster similar behaviour in the org. By inculcating and encouraging a culture of working out loud, organizations can gradually begin to see greater engagement on their enterprise social networks as well. Meaningful engagement!